Rolex has created some of the most surprising, beautiful and unusual Day-Dates for the Arab States in the Gulf. The manufacture's custom pieces date back to the 1950s, when Rolex fitted Arabic discs to the most luxurious Day-Date watches. Very few "Arabic" Day-Dates were produced during this period, and the earliest examples were almost exclusively cased in platinum. With the introduction of reference 1804, Rolex produced a Day-Date that completely differed from any "Arabic" Day-Date the firm had ever produced. The watch not only featured an Arabic Day and Date wheel, it even displayed applied Eastern Arabic numerals in lieu of regular Arabic numbers. The watch is named “Scheherazade”, and proudly displayed in Day-Date, The Presidential Rolex by Pucci Papaleo and sold at Phillips' Glamorous Day-Date sale, lot 24. Today, Rolex continues to dazzle and surprise, with its unusual and beautifully finished watches. It cultivates and sustains its successful relationship with the Arab States by producing a multitude of special order watches for the region. 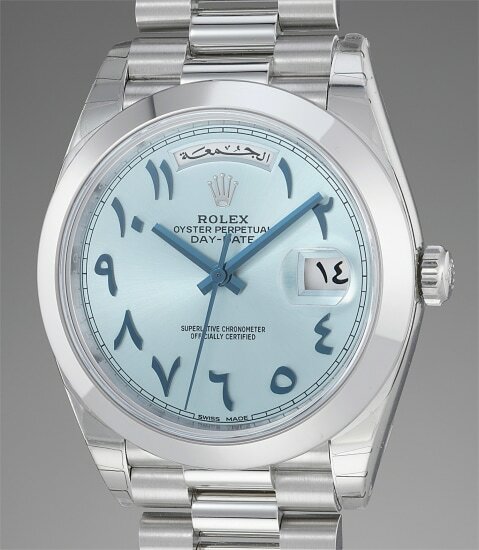 The present example, produced in exceedingly limited numbers and sold only by Middle East retailers, pays homage to the dazzling Arabic Day-Dates of the 1970s, most notably in its applied Eastern Arabic numerals, which is almost identical in design to the beloved vintage Arabic Day-Dates of the past. The watch is cased in platinum, a further nod to the original Day-Dates made for the region. A few updates make this watch an exceedingly modern and fresh watch. The most obvious, is the ice blue dial, which Rolex exclusively uses to complement its platinum watches. Its 40 millimeter case has great presence on the wrist, and gives the watch incredible weight, truly attesting to Rolex's ingenuity. This watch is presented in virtually new condition with its stickers still intact.